There are several types of pots that can be used when planting aquatic plants into a water garden. While many can work, some may be better than others. The best way to choose what is right for your plants is to know the differences. Aquascape Aquatic Fabric Planters are ideal for all pond plants. The fine porous material allows water in, but keeps soil from entering your pond. The flexible material makes it simple to place the plants where plastic pots will not fit. Aquatic Planters quickly blend in with the rest of the pond. Fabric pots combine the best features of no-hole pots and baskets. The fabric is woven tight enough that it is not going to allow well-packed soil to leech into the pond, while still being open enough to allow the plant to pull extra nutrients directly from the water. Fabric pots are also variable in height, as if the pot is too tall, you can simply roll the edges down to the desired height. The flexible bottom will also allow the pot to sit more level even if the pond bottom is not level. The only downsides of the fabric pots are that they cost a little more and are more difficult to move around outside the pond. Aquascape Planters will not break or crack like plastic planters. Aquatic Containers are the Hard-to-Find "no hole" pots specifically designed for water gardens. No-hole pots are usually plastic. These are made specifically for water garden plants. Only the top of the pot is open, so with a top layer of gravel the soil remains where it should, in the pot. No-hole pots are easy to use and easy to move around. If using no-hole pots, it is critical that the water level never drop below the top of the pot. Excellent for Lotus & Water Lilies. Planting Baskets are manufactured with built in handles for easier carrying. They come in several shape configurations. 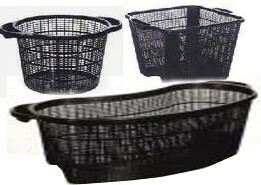 Basket-type containers are a plastic mesh. The downside of these is the same as pots with holes, the open areas in the pots allow the soil from within the pot to leech out into the pond water. In a planting basket, the plant can benefit from the nutrients in the water which can more easily be used by the plant in this type of pot.